I very vividly remember my first encounter with a Focaccia with some herbs & garlic. Absolutely delicious. Since then, I have baked this versatile bread with countless number of toppings. Focaccia starts with a simple dough, much easier than most of the bread doughs. ....Just place it in an oiled pan, press the dough out to the edges, dimple it with finger tips, flavor with any fragrant toppings, let it rise a bit and bake it. Done. :). To serve them as a simple treat to children, shape them into small focacce or focacine (little discs made just to fit the palm of our hands). When eaten warm, focaccia can be a one-dish meal, a snack or perfect picnic food. Slit the bread and fill with onion, mushroom, clam or even creamy cheese fillings. Possibilities are just endless. The twist in this recipe is that I have used my 8 inch cast iron skillet to make the bread instead of the normal baking pan. The result is just spectacular as the little skillet is my new love these days :). 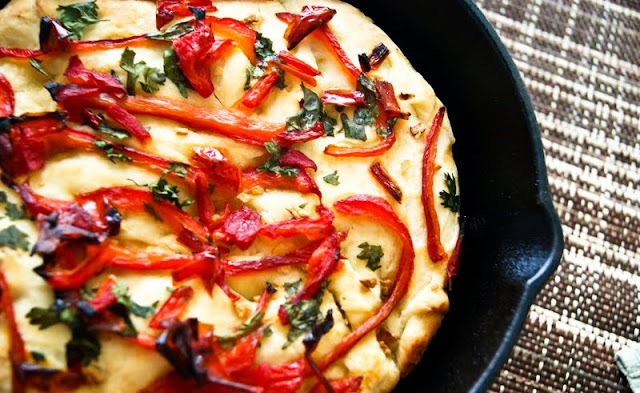 I hope, I have inspired you guys to bake some fresh Focaccia bread for dinner tonight :D.
The subtle sweetness from the red bell peppers with garlic infused oil and fresh herbs on top - this bread tastes perfect and is very simple to make. Dip each bite of bread into some good olive oil on the side, it is the bread you all have been waiting for. Enjoy. Sprinkle the yeast over the warm water in a medium bowl, whisk in and let it stand until creamy, for about 10 minutes. Stir in 1 tbsp of oil. Combine the flour and salt, stir in the yeast mixture, with a wooden spoon until the dough comes together. Knead in a lightly floured work surface until soft. smooth and elastic for 5-6 minutes. If you are using a heavy-duty-mixer, set the paddle attachment in place, add the flour and salt to the yeast mixture and mix until the dough comes together. Change the dough hook and knead for 2-3 minutes until smooth and soft. First Rise: Shape the dough into a ball, place in a lightly oiled container, cover tightly with plastic wrap and let rise for 20 minutes. Atleast 30 minutes before planning to bake, heat the oven to 350F. Shaping and second rise: Move the risen dough to an oiled cast iron skillet. The dough will be stretch easily to fit the bottom of the skillet. Dimple with fingertips, drizzle with the garlic-infused oil and scatter the pepper strips and parsley over the top. Sprinkle salt. Cover with a towel & let rise for another 20 minutes. Baking: Set the skillet directly into the oven and bake until the focaccia about 25-30 minutes. Cool briefly and then place on the rack. Serve warm. Cut the peppers into halve, remove the seeds and slowly oven-roast them at 350F for about 15-20 mins or longer. the skin must be blistered and charred. (or) Set them on a broiler pan & broil about 3 inches from the heat. Place them in a paper or plastic bag, close tightly. Rest for 10-20 minutes. Meanwhile, heat the oil in a small pan and saute minced garlic on a very low flame. Donot let it burn. Set aside and cool slightly. Peel off the skins of the peppers and slice into thin strips. This was my submission to a "Your Best Red Bell pepper Recipe" contest on food52. For the long weekend, we made a trip to the valleys of Yosemite, coming up next is a travel post on it. :) Hope you all enjoying your last few days of summer. love focaccia and you made a super delicious one Siri. This is beautiful and I LOVE that it's made in a cast iron skillet! Awesome looking focaccia, am loving it.. I seriously need to start making focaccia! This looks SO good! Lovely texture of the bread! Perfect bite for any meal.